Space Researchers have added more evidence about the ongoing mystery of KIC 8462852, aka Tabby’s Star. 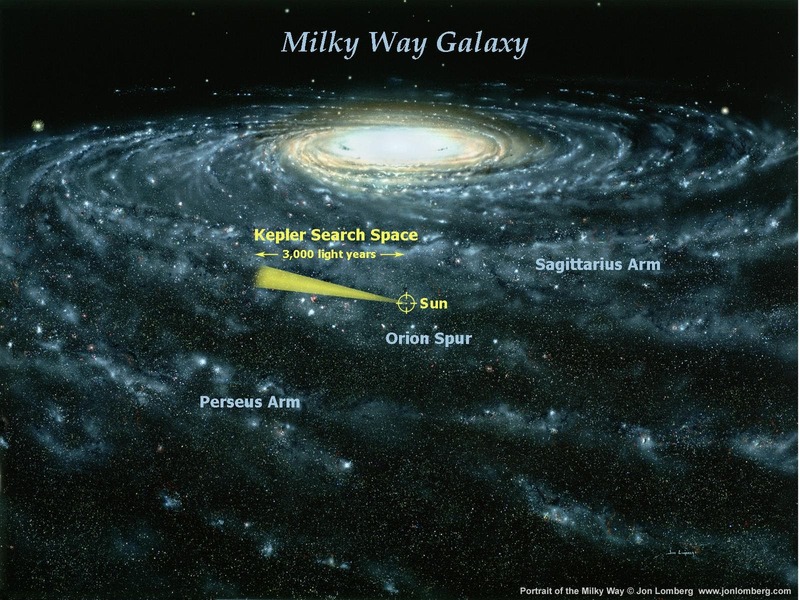 Benjamin Montet with the California Institute of Technology and Joshua Simon with Observatories of the Carnegie Institution have enhanced their study of the star by analyzing data from the Kepler space observatory over the past four years. They found that the star has been decreasing in brightness at an unprecedented rate. The tale of Tabby’s Star began in September of last year when Louisiana State University astronomer Tabetha Boyajian reported anomalies in the unusual light curve of star KIC 8462852—over the years 2009 to 2013, its light appeared to dip in ways that did not conform to what would be expected if it were due to a planet passing in front of it, temporarily blocking some of its light. Her paper led to observations, commentaries and theories from others in the space community, though no one was able to come up with a reasonable explanation for what she had found. One researcher actually proposed that it might be due to alien activity. Then, earlier this year, Bradley Schaefer with Louisiana State University published results of his efforts studying photographic plates that had captured the star going back to the 19th century—he reported that the light from the star had dimmed 19 percent over just the past century. His report was not received warmly by all, as many suggested his data or approach was likely flawed. But now, another team has found something similar. Montet and Simon studied images from the space-based Kepler observatory and found that light from Tabby’s Star had decreased in brightness by approximately .34 percent a year for 1000 days starting in 2009, which was actually twice the rate that Schaefer had found. Even stranger, they found that over the next 200 days, the brightness of the star dimmed by another 2.5 percent before it finally leveled out. 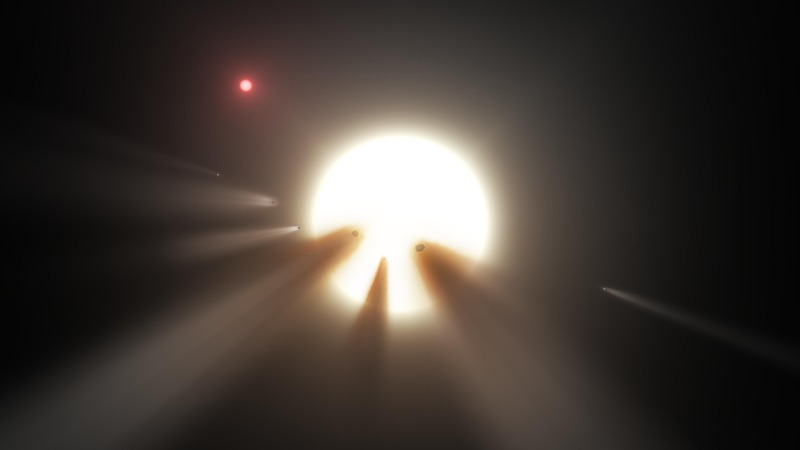 Various scientists have offered possible explanations for the strange behavior of Tabby’s star—from comet swarms to planetary remnants to the construction of a Dyson Sphere-like structure around the star to capture its energy by aliens—but so far, none of the theories has been able to take into account all of the odd observations. That may change soon, however, as Boyajian, the astronomer who first noticed the star’s strange behavior, ran a successful crowdsourcing campaign to pay for time at the Las Cumbres Observatory Global Telescope Network over the course of a year—this will give her a chance to catch the star in the act of blinking, allowing her to alert the rest of the astronomy community, which will presumably its sights on the star at once, and in so doing, perhaps solve the mystery. Using data from NASA’s Kepler and Spitzer Space Telescopes, the artist’s concept at the top of the page shows a star behind a shattered comet. Observations of the star KIC 8462852 by NASA’s Kepler and Spitzer space telescopes suggest that its unusual light signals are likely from dusty comet fragments, which blocked the light of the star as they passed in front of it in 2011 and 2013. The comets are thought to be traveling around the star in a very long, eccentric orbit.